Penn State softball pitchers gained 5 mph in 9 weeks! 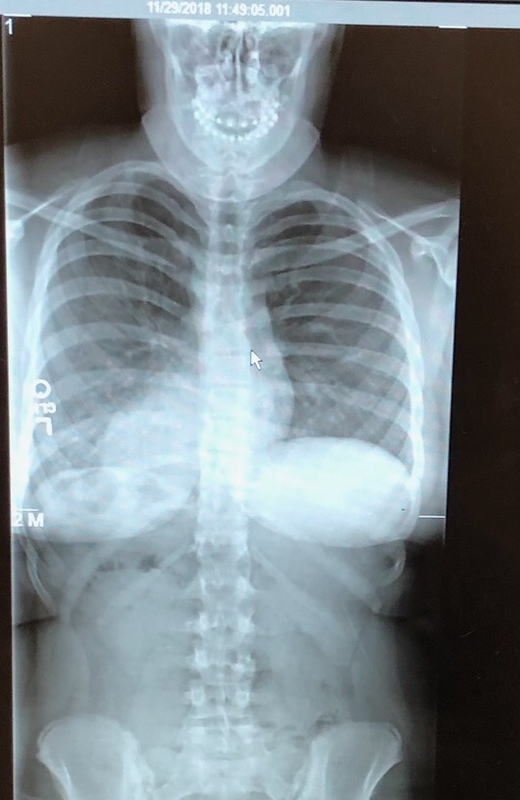 I talked to you about my daughter in October 2016 at a Jennie Finch Camp in Brandon, Ms. At the time, my eleven-year-old daughter, Amanda, was pitching with scoliosis. She was diagnosed with scoliosis in June 2014. At the end of 2014, our pitching coach installed a Finch Windmill in his gym, and Amanda started using it once or twice a week at lessons. By mid July of 2015, the curve in her spine had improved tremendously. Within the next year, Jennie Finch hosted her pitching camp in Brandon. I met with you, and you convinced me to purchase a Finch Windmill to use at home. From that point on, Amanda used the Finch Windmill three to four times per week. In November of 2018, Amanda went in to her usual checkup to find out that her curve is completely gone, and her back is perfectly straight now. She was released from her Scoliosis doctor. She never used a brace or surgery to fix her scoliosis, just the Finch Windmill. We want to thank you for not only for inventing the windmill but also for convincing me to purchase it at the camp in 2016. I’m convinced that the Finch Windmill helped correct my daughter’s scoliosis by strengthening the back muscles of her non-pitching arm. I have attached a few pictures. 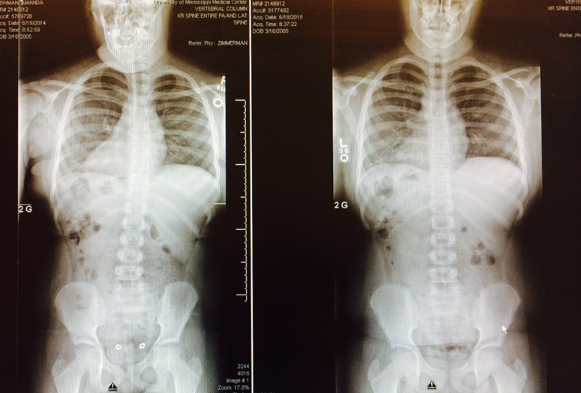 The double x-ray is from June 2014 (left side) and from June 2015 (right side). As you can see, there was a huge correction in her spine from 2014 -2015. The other single x-ray is from November 2018. Her spine is straight. Thank you! I authorize you to use this letter and all of its pictures for the promotion of the Finch Windmill. I have been coaching for several years and I would recommend the Finch Windmill Machine to any pitchers. We have a pitcher on our team who has taking up bowling and her pitching got spotty due to it. Since we started with the Finch Windmill her pitching has improved unbelievably. This machine is well worth it. Must get it to see the difference. Helps with speed, form & accuracy very much. Hi, I hope all is well with you and your family. My name is Shane, we spoke around Christmas last year. My daughter is Ally. The girl with scoliosis and the back brace that Jennie signed at the Jennie Finch Camp in Virginia last summer. Ally has been using the Finch Windmill for approximately 6 months now and it has not only improved her pitching and throwing just as you said it would, but it has balanced out the muscle definition in her back. This is one of the best things that she has been able to do on a daily basis to help her not only with her pitching, but also in dealing with scoliosis. The added muscle on her weak side has helped decrease her back pain tremendously. And now, after a visit to her orthopedic Dr. today, we were told that there will be no need for surgery and... Are you ready for this? She is out of her back brace 6 months ahead of schedule. The curvature in her spine has not decreased, but it has stopped getting worse. With the type of curve that Ally has, that is all we were trying to accomplish. So I have to say that the Finch Windmill has truly been a blessing in so many ways. I spoke with the doctor about the Finch Windmill and he was very impressed with it's ability to help in her treatment by building the weak side muscles which has decreased her pain and stopped the strong side muscles from pulling so hard on her spine. I sing the praises of your windmill every chance I get. There are local coaches that have bought one because they have heard me rave about the benefits of the Finch Windmill and I will continue to spread the word. I can't thank you enough for your time last year and for providing something that has helped my daughter in so many ways. And if you ever need someone to sing the praises of your windmill, I would love to help. Thank you so much for the help. My niece found the videos very helpful. We live apart, otherwise I would just show her. I cannot say enough good things about this product. I pitched for a travel ball team, league team, and eventually a high school. The entire 7 years I used the Finch Windmill I did not have any injury to my arm because my muscles were so strong. Using the Finch Windmill, at 12 years old I was pitching at 60 miles an hour. As far as softball pitching today I don't know of anything that helps build speed and strength like the finch windmill. I love this product; have a blessed day!! Thank you for your call concerning the additional mounting bracket. I appreciate your attention to detail. My daughter attended the May 14-15 camp in Ardmore, OK. As I said in the order information, I have owned a Finch Windmill for several years. As a physician and father of a pitcher, my first priority is injury prevention. That is why I purchased the Finch Windmill years ago. My daughter uses my device 4-5 times per week. While balance and injury prevention is my motive for using the device, I have noticed a welcomed additional benefit. My daughter, at age 11, throws the 11-inch ball 50+mph. In my limited softball experience, I find this incredible. I understand that West Texas is behind in the national fastpitch community, but my daughter dominates the local competition. I attribute her success to frequent use of the Finch Windmill. I assume that you are seeking testimonials to use in marketing your product. You have created an exceptional product, which promises both short and long term pitching success, and develops the young body to withstand the repetitive stress of the pitching motion. I applaud your ingenuity and agree that God had a hand in the creation of this device. As a physician and father of a young pitcher, I offer my full endorsement of the Finch Windmill. If there is ever anything I can do to help promote your product please do not hesitate to call. As a Christian, I am grateful for the example you and your daughter have set for the young girls playing softball. My daughterï¿½s teammates and opponents look up to her because of her pitching ability. Before every game she gathers her teammates and leads them in prayer. Jennie and Leahï¿½s Christian leadership served to strengthen her belief that God blessed her with pitching ability in order to bring glory to Him and fulfill His will. I cannot express my gratitude for your family and friendï¿½s willingness to share your faith. As I said, please feel free to use my credibility as a physician to market the Finch Windmill, and do not hesitate to call if there is anything I can do for you. Just wanted to drop you a note to tell you how pleased we are with the Finch Windmill. My daughter has be using it religiously and I can personally tell you that her Pitching, Batting and Throwing speed have increased. She was having a few issues with Control while pitching but lately, there seems to be no problems. No more wild pitches High/Low etc. and her fastball appears to be faster just from what I can see and the sound of the catchers glove and remarks during games from the opposing teams. I was told by her coach at batting practice that her bat speed lately has been very fast for her age(12) and power has increased. This appears to be a result of using the Finch Windmill. She has also improved in her Track events of Shot Put and Discus. Thanks again for all your great support on the phone and I definitely would recommend this product to anyone needing to improve balance, speed and strength. Oh, one last comment. My Daughter has not complained of any Shoulder or Back discomfort since starting on the Finch Windmill. She had problems in the past with soreness in her shoulder and back after pitching and says she doesn't feel any discomfort anymore. In addition, the product is very well constructed. I am impressed with the attention to detail and the quality parts. You have my permission to use this update of my Daughters results from using your Finch Windmill on a regular basis. Just writing to tell you about the improvement in my daughter's volleyball hitting as a result of using the Finch Windmill. If you recall, several years ago I wrote you about my other daughter using the Finch for pitching. She increased her fastpitch pitching velocity significantly by using the device. Well, my daughter, wanted to improve her volleyball hitting velocity. I recalled that you said using the Finch would increase overhand throwing speed. Since the volleyball hitting motion is similar to overhand throwing, I convinced her to use the Finch Windmill to get better. She consistently uses the Finch Windmill at least four times per week and does the exercises you recommend. To say that her volleyball hitting has improved is an understatement! She is absolutely pounding the volleyball. So much so that she has been noticed by a number of college coaches! In closing, let me just say that I am a firm believer in the the Finch Windmill as a training tool and that if you ever need someone to provide a reference for this device, let me know. I am writing concerning the Finch Windmill. Two years ago my daughter injured her bicep tendon while pitching. She went to physical therapy and got better. But when she went back to pitching, her injury recurred. I met a man that knew a lot about pitching and he told me about the Finch Windmill. After using the Windmill for three weeks, my daughter's pain went away and her arm does not bother her anymore. We told her doctor and he recommended that she should keep using it. After two years of using the Windmill, she has been injury free. Thank you for all of your help. Approx. three to four weeks ago, I bought a Windmill and my daughter started training with the apparatus. She is a catcher and we were trying to increase her throwdown speed to second base. She has increased her throwing speed so far by almost two miles an hour (just in the past three solid weeks of training) and her throwdown time has increased from an average of 2.4 seconds with a best of 2.2 seconds to now an average of 2.2 seconds with a best of 2.0 seconds. This time is measured from the time the ball hits her mitt behind the plate, she gets the ball into her throwing hand, makes the throw and the ball hits the mitt at second. This is an awesome piece of training equipment. A small testimonial for you: Our daughter, (now 19), started having problems with her shoulder about 6-8 months before your windmill was available. She is very muscular in the shoulder/back area and has problems with keeping her shoulder muscles loose -- especially in the winter. Rubber band exercises would kind of work, but the exercise regimen took too long. We bought one of your windmills, and it has made all the difference in the world for her shoulder. No more popping, tightness or soreness!! She started college last fall and will most likely take her windmill back to school with her for the upcoming softball season. Doug, we bought your windmill a couple of months ago and our 12 year old daughter is using it regularly. She has been pitching for a year and a half and we have already seen more pick up in speed since we started using the windmill than we did the first year. One unexpected side effect has been in her gymnastics, where it appears the windmill helps with some of those skills as well! Her pitching coach is Bill Dryden and he really swears by the windmill. Last November (2002) I purchased my first Finch Windmill for the High School softball team in Ohio. I then sat down with our pitching staff and got a commitment from five out of my six pitchers to work out with the machine at least five days a week. We were only able to pitch three days a week because of limited gym space. I'm extremely happy with the results gained in what I consider a short time. All pitchers increased significantly in speed. One freshman pitcher went from 48mph to 54mph with occasional bursts of 56. Another freshman went from 50mph to 54mph. A sophomore who was pitching around 52mph was able to hit 59mph with bursts of 62-63 mph. Two Juniors who averaged 54-55 were able to consistently throw around 58 to 59mph with one hitting as high as 62 on several occasions. With such positive results I'm happy to give your product a "big "endorsement. I'll probably be ordering another Finch Windmill sometime soon. Thanks for all your advice and tips in our phone conversations. Your product is great and has made a significant contribution to our program. By the way, our JV squad went 23 and 2 and the varsity took 1st place in our division 20-7. "If there were an award given for the effectiveness and efficiency of an invention, the Finch Windmill would be the recipient. It is the most innovative device developed in the last five years which genuinely benefits softball training." "I have seen not only great results from pitchers who use the Finch Windmill, two of my position players have increased their throwing velocity 6-10 MPH and one of the girls who previously had arm trouble no longer has any pain when she throws." "In this time of $250.00 bats and $200.00 gloves, the Finch Windmill is a worthwhile investment for all athletes who take their throwing skills seriously." "The thing I like best about the machine is that a pitcher can simulate 120 "pitches" in a matter of minutes without the stress of ball release." "All joints consist of bones, muscle and connective tissue (cartilage, tendons, ligaments and framework of tissue in which muscle cells reside). Studies have revealed that connective tissues will actually remodel to conform to stresses that are put upon them. "In the six months since we have installed the Finch Windmill, we have noted marked improvement in arm/wrists strength and speed on almost all of the 150 girls who use the Windmill regularly." "I also have had my 14 yrs old daughter, Ali, using the Finch Windmill since I purchased it in November. Her speed has increased from49 mph to 55 mph in just 6 weeks. The exerciser is so simple she uses it completely on her own and my six yrs old, Jeff, has been using the Finch Windmill with my daughter's help. Remarkably, his speed has improved from 31 mph to 38 mph in just 4 weeks. Jeff's bowling has also increased from 44 average to 63. He is able to throw the bowling ball with much more authority." "The Finch Windmill is an excellent tool for improving skills. Both the windmill pitch and the overhand throw can be improved through proper use of the Windmill. ...Being able to vary the tension throughout the entire motion can strengthen the upper body while giving resistance to the exact muscular movement which should result in more velocity. Using the Windmill [for both sides of your body] is a technique that can enhance [your overall] performance." "The Finch Windmill has become a very important training tool for all our Junior High and High School pitchers. I highly recommend the Windmill to all of my pitching students to not only improve their strength and endurance but also to emphasize proper repetition of the arm circle and shoulder rotation." "Forget all the statistics, forget all the percentages, when it happens to YOU it's a 100%." The Finch Windmill is a well-constructed, well-designed piece of equipment. I believe the Finch Windmill to be the best of all the devices available that are used to train the shoulder muscles used in the windmill pitching motion. While weighted balls may appear to offer similar benefits, they have the disadvantage of adding centrifugal forces to the shoulder joint, which increase the risk of rotator cuff injury. The Finch Windmill applies forces, which only oppose the rotational pulling forces of the pitching motion, thus minimizing the risk of training injury. For the same reasons, the Windmill is also a very useful device for training the muscles used in the "over the top" overhand throwing motion. The arm motion utilized in this throwing technique is closely mimicked by the Finch Windmill which, as in the pitching motion, allows the muscles to be trained with slightly increased resistance in the same coordinated movement. Power, a function of speed and strength, is of prime importance in pitching and throwing. The Finch Windmill allows for high-speed training with increased resistance and an ultimate increase in power, all under controlled conditions. It would also appear that the Finch Windmill would be an excellent device to use with patients rehabilitating from shoulder problems. With its' infinitely variable resistance, it could be used for both strengthening, even at very low levels, and increasing range of motion.